My father is really big on breakfast. The meal is literally celebrated, and as should be, is considered the most important meal of the day. Eggs formed an essential part of the meal, along with at least 2 different types of jams, butter, freshly toasted bread and fresh cream. As I grew older, I noticed my father’s breakfast habits change. From his regular fried eggs, it became hard-boiled eggs, and then oatmeal with sugar. By the time I left India and moved to the US, all he ate was oatmeal with honey and low-fat milk. Butter is now bought only when it is required for a special recipe or for guests. What never changed was his cup of chai every morning. That, he never gave up. Chai is the quintessential Indian beverage that every Indian has a special memory of. Evenings spent with that special someone at their favorite roadside tea stall. Reading The Times of India every morning with a cup of chai made just right. Ending a night out with friends with warm cups of masala chai. Having chai in clay cups at railway stations on the way to Delhi. We all have our stories. Chai the way it is prepared in India today, was originally made so as to mask the taste of inferior tea accessible to the common Indian. Premium blends and the best quality teas were consumed by the British before independence in 1947, and good quality tea was prohibitively expensive for the common Indian. The method of preparation of course, has just stuck on over the years and you’ll rarely find an Indian have black tea. Every Indian you talk to will probably also have his / her own favorite method of preparing Chai. Variations include brewing the loose tea leaves in boiling water, brewing them in milk, brewing tea leaves along with spices (known as Masala Chai) and brewing the chai with pieces of ginger (known as Ginger or Adrak Chai). Some like their chai weak, some like it strong. Some like more milk, some less. Some prefer using inferior quality tea dust, some like specific brands of tea. An Iranian cafe next to my home sweetens the chai with condensed milk and then boils the mixture for at least an hour. The result is a thick, creamy Chai that is really really delicious and refreshing. 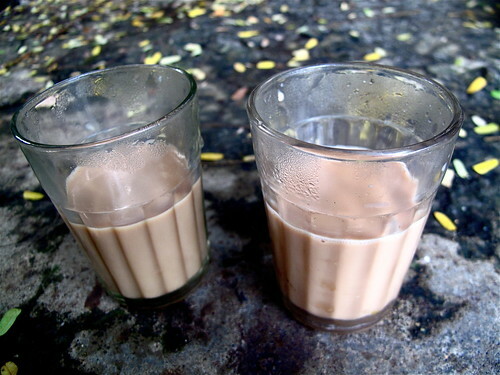 Did you know that the flavor of chai is enhanced by the height from which it is poured into a cup? I have a bit of a detailed process to making chai. I like mine thick, so I simmer the brewed tea with milk for a good amount of time. I flavor my Chai with spices and ginger pieces, and sometimes, even vanilla sticks. I have it with Tea rusk and sometimes, hot buttered toast. 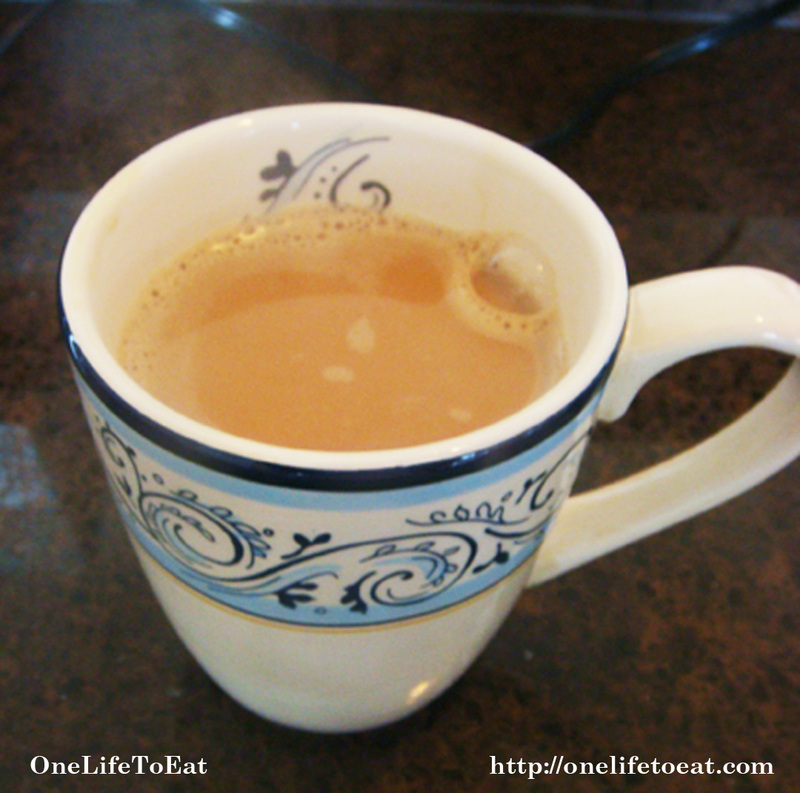 Hope you try my recipe for chai and enjoy it as much as I do! Hey Jenn. No they don’t carry Red Label in decaf 🙂 The decaf concept hasn’t really taken off in Indian beverages. You can substitute Red Label with any decaf loose tea. I think the tea will taste just the same that way. Cheers to your next cuppa! I got your message on my blog just yesterday!…sorry for the super late reply. 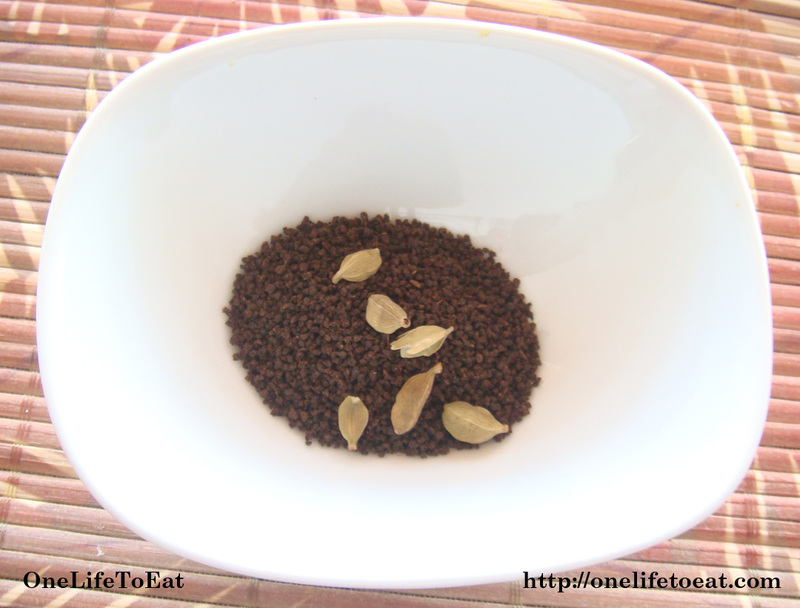 I did recall that my sister mentioned that you had put up a masala chai recipe and to let me know…I decided to have a look! Looks awesome — I think I’m going to give it a try, tomorrow and relax with a cup on my first day off in a long while! Thanks for visiting my blog – and please do keep checking in — I will be updating very soon now that I have some free time! I’m definitely going to keep up with yours! Thanks for the reply Zoyah! Hope you enjoy the chai. And yes I quite like your blog. The pictures are very well taken. Look forward to having you over again! Hi sabera, Iam here from zoya’s blog and absoluteley loved ur tea…..similar to what we make, but we dont add vanilla:)….u have got soem good collection in here….let me go and have a peek at ur other recipies….. I am so happy to know about your blog and can’t wait to explore more. I made your chai tea recipe and IT IS SO GOOD! I wrote a post about it and linked back to you, let me know if this is ok. Thanks and nice to “meet” you! 😀 So glad you like my recipe Amy! And even happier to know you liked the chai tea 🙂 And thanks for linking to my post! I just checked out your blog and am loving the posts so far… look forward to commenting / seeing you more here! Hey, I’ve seen videos of tea vendors from India pour from really high up… I thought it was just for show to impress the tourist taking the videos until I read here, “flavor of chai is enhanced by the height from which it is poured into a cup.” I was wondering if you could explain why??? I’m just curious.. I like knowing nerdy details such as this. Thanks! Hi Vicky. I’m not entirely sure but I believe pouring the chai from a height cools it, and brings it to just the right temperature before serving, which enhances the flavor of the chai. Do you slice or chop the ginger? Or do you peel and leave it whole when adding to the pot? Just found your blog and cant wait to try a few of the recipes. Thanks. You could slice or chop the ginger. The idea is to release the juices from the ginger when making the tea. Hope you enjoy trying more recipes!